The Grange Country House is a beautiful Victorian House situated in its own grounds, with ample parking and excellent views from our terrace overlooking Keswick-on-Derwentwater and the surrounding mountains. This elegant Lakeland House, proudly owned by Mark and Sally Huit offers quality and comfort in a warm relaxing atmosphere. The Grange was a previous Keswick in Bloom Award for their lovely garden and is featured in many leading guides such as the AA Best Bed and Breakfast Guide. We are proud to be awarded VisitBritain's new 'Breakfast' Award - only given to those providing exceptional quality breakfasts - with lots of choices and featuring local produce on their menus. Where it is not possible to buy locally, we will provide you with quality Fair trade products such as tea, coffee, sugar and fruit. Whether you prefer a light and fresh breakfast option or to enjoy the luxury of a full English breakfast, we will ensure plenty of choices to suit you. The Breakfast room is where our extensive menu is served between 8:00am and 9:30am and is spacious, light and airy, boasting wonderful views of the surrounding fells. It is a great spot to watch the garden birds (and occasionally a red squirrel) visiting the seed feeder in front of the window. We are very happy to cater for special dietary requests and always have a selection of vegetarian and vegan choices as well as Gluten free options and milk alternatives. The comfortable lounge is available all day for the best of conversation, reading, or a quiet drink whether it be tea, coffee, a glass of wine or a local beer. We have a reading room full of maps and local visitor information for you to peruse. Each of our en-suite bedrooms are individually decorated and furnished to five star Guest House standards and are equipped with hair dryer, beverage tray, toiletries, colour television, clock radio and mineral water. 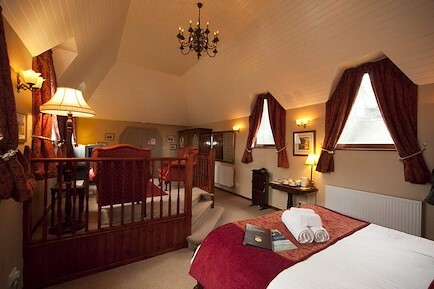 We upgrade and redecorate a selection of rooms each year. The town centre, with its huge variety of eating places and specialist outdoor shops, is an easy walk from The Grange. To the front, the Grange enjoys a lovely ballustraded seating area and from here you can sit and enjoy the views and the fine garden. Leave the M6 at Junction 40 and take the A66 for 13 miles, to the first slip road into Keswick. Drop down the hill and then turn left, uphill on the A591 towards Windermere for half a mile. Take the first turning right onto Manor Brow. The Grange sits 200 yards on the right overlooking Keswick. When you begin descending the hill towards Keswick, there is a left turn, signposted to Castlerigg Manor which drops down Manor Brow. The Grange sits 200 yards on the right overlooking Keswick. Your enquiry will be sent directly to The Grange Country House. Please fill in as much detail as you can.